The Virginia Commonwealth University School of Medicine often partners with the community to enhance the quality of life and learning opportunities for its patients, students, faculty and staff, as well as the public at large. School of Medicine faculty service to the scientific community includes participation as journal editors, editorial board members, reviewing editiors and study section members. The school’s Practice of Clinical Medicine (PCM) program pairs each student with a preceptor in the community for two afternoons a month. Of the more than 200 preceptors who participate in the PCM course, nearly half are M.D. or housestaff alums of the medical school. Students choose either an urban or rural underserved track. Complementary international experiences are coordinated during the M1, M3, and M4 years through the student organization HOMBRE and through the Global Health Program in the Department of Family Medicine and Population Health. Students participating in I2CRP may be eligible for state and federal tuition loan repayment plans. Read more about the I2CRP Program here. VCU’s School of Medicine offers medical students unique experiential learning opportunities through programs like the Honduras Outreach Medical Brigada Relief Effort (HOMBRE). Each year a small group of first-year medical students are selected to work alongside VCU faculty providing medical services and healthcare education to underserved, rural populations in Honduras and the Dominican Republic. HOMBRE team members work in healthcare clinics or on public health projects geared to improve villagers’ quality of life. service to others is an integral part of what it means to be a health care professional. Members of HOMBRE gain invaluable experience through actively and intimately serving others. students learn best by doing. At all levels of the organization, students take on key leadership roles and, with appropriate mentoring, are responsible for the success of each project. Visit the HOMBRE website to learn more about how you can help. Or contact Mark Ryan, M.D., HOMBRE Board President at mryan2@mcvh-vcu.edu. Students from the VCU schools of Medicine, Pharmacy, and Dentistry partner with the CARITAS Shelter program to provide free health screenings to individuals who are participating in emergency shelter services. CARITAS is a nonprofit organization that provides year round emergency shelter for adults and families in the greater Richmond area who are experiencing homelessness. Screenings are offered approximately once per month in community settings for six months throughout the academic year. Read the full article here to get the details about their positive impact. Project ACEe (Academic, Career and Educational experiences) is a program sponsored by the School of Medicine designed to expose disadvantaged high school students to the medical profession by providing them with workshops and mentoring opportunities. Preference is given to students attending Richmond Public Schools, however, students from Chesterfield, Henrico and Hanover county school systems are welcome to submit applications for consideration. Project ACEe is a pipeline program that hopes to increase the number of disadvantaged health care practitioners who will practice in the state of Virginia. The annual RAM Clinic held in Wise,Va each year provides free health care to an estimated 6,000 people at the local Virginia-Kentucky Fairgrounds. Volunteers including physicians, nurses, dentists, pharmacists, radiologists, podiatrists, respiratory therapist, lab technicians and students go to Southwestern Va for the three-day clinic. Health care services provided include comprehensive screening for diabetes and hypertension, procedures such as mammography, colon cancer screening, retinal screening using telemedicine technology, chest x-rays, pulmonary function studies and some gynecological procedures. Full dental services are offered by faculty and students from the VCU School of Dentistry. To complete the full spectrum of healthcare, ophthalmology services provide complete eye examinations and a full-service eyeglass lab, where free eyeglasses are made on the spot. Dr. Michelle Whitehurst-Cook, Associate Dean for Admissions and family physician, recruits students and physician volunteers for the RAM Clinic, coordinates and attends the clinic with the volunteers. An information and orientation meeting for the Ram Clinic will be held in early spring. If you are interested in volunteering or want more information in the meantime, contact Dr. Whitehurst-Cook - (804) 828-9629. The VCU School of Medicine is the only medical school in the country which has its own Center for Human-Animal Interaction (CHAI). The center brings together faculty members and administrators from various disciplines to provide students with a wide range of educational opportunities. CHAI offers a M4 elective, a PGY-4 elective, internships and volunteer opportunities to medical students, while students from the Monroe Park campus may work at the center as volunteers or as work-study employees. 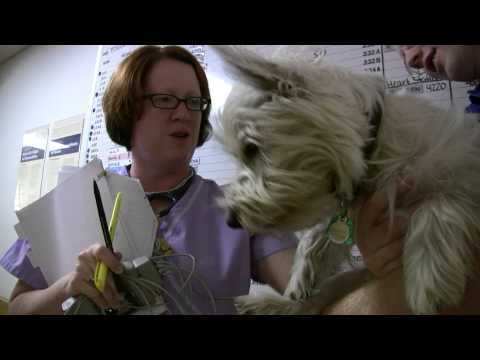 The center also serves the VCU Health System through its Dogs on Call program, which provides therapeutic visits to patients and staff members in pediatrics, oncology, psychology, psychiatry, emergency medicine, rehabilitation, physical therapy and various other departments at the VCU Medical Center. The center is deeply committed to promoting interdisciplinary research in the field of human-animal interaction. Past research studies conducted at CHAI have been published in American Behavioral Scientist, Anthrozoos, Psychological Reports, the Journal of Mental Health and the Journal of Business Education. Published research studies at CHAI include an investigation of the effect of animal-assisted therapy on patients referred for pain and palliative care at the NIH Clinical Center and a study on brain wave activity in normal adults interacting with a therapy dog. A pilot study conducted by the center suggests that healthcare professionals who spend as little as five minutes with a therapy dog experience the same level of stress reduction as healthcare professionals who spend twenty minutes resting quietly. The Center works collaboratively with a large network of dedicated individuals and institutions, including Virginia Commonwealth University, VCU’s School of Medicine, VCU's School of Business, the CHAI Executive Committee, the CHAI Inner Circle, VCU's School of Nursing, and the VCU Medical Center. The center also works closely with regional veterinarians and volunteers to provide the local community with services such as Pet Loss Support, continuing education for professionals and community education workshops. Currently, CHAI depends heavily on donations to survive, but Center Director Dr. Sandra Barker plans for the center to eventually become a self-sustaining institution. Her goals for the program include funding more research studies, expanding the program to include more students and residents and exploring new treatments based on human-animal interaction therapies. She hopes the center will continue to be an integral part of the VCU School of Medicine. Visit the Center for Human-Animal Interaction Web site to learn more about this program. The community-based, student-led screenings offer services from the schools of Medicine, Pharmacy and Dentistry.